Apologies for the delay in posting this. Bird numbers are increasing at the zoo with an old Silvereye returning after 2997 days between captures (originally banded 9 May 2009). This beastie had two sets of bling applied, one being an A band which made us instantly aware that it was an old bird. Photos courtesy of George Hobson. This morning I received a recovery report from the DOC Banding Office of a Silvereye that was caught by a cat near Cromwell. 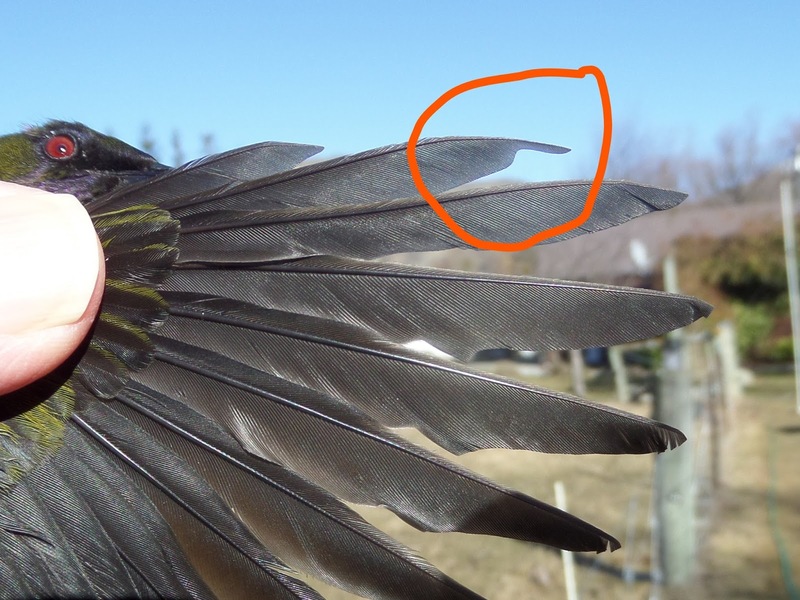 It had been banded in the apple orchard next to the main banding site in Littles Rd near Queenstown back in May and died in Ripponvale Rd near Cromwell. Although the distance is not huge by international standards it is one of the furthest we have had for a while. The distance in a direct line between the two sites is approximately 35k but as this is over some pretty rough terrain it probably took an easier route. Interestingly it was banded in an apple orchard and it ended up in an apple orchard, probably a coincidence but then it just might have liked the taste of apples. Queenstown Sat 5 Aug - a lot more little green jobs. Now back in Christchurch after a short trip south. Sorry about this late post but things got a bit busy after spending most of Saturday with nets up. Didn't actually spend that much time banding more like recording numbers. Ended the day having caught 81 individual birds, the actual number of handlings would have been at least twice that as many Silvereyes were caught multiple times. I know I caught the first bird of the morning, Ap-19310 at least 6 times. This is the most birds I have caught in one day at this site. There were 7 species caught with 33 new and 48 recaptures. By far the majority were Silvereyes with 24 new and 42 recaps. With a total of 66 individuals caught this is the highest number of both total birds and silvereye recaps caught in one day. Twenty four of the Silvereyes were also caught 2 days ago and 38 were new for the month which probably means that there has been considerable movement within the population. Four of the recaps had been banded in Sept 2015 within a week or two of starting banding here including the oldest bird from Thursday which is now 2 days older at 687 days. Bellbird - 1 (4) the new bird was male and the recaps 1 female 3 male including the oldest recap for the species. Five birds in a day is the highest total for Bellbirds. The wing of the new Tui showing the lack of a "notch" - aging it as a first year bird. We arrived back down here on Tuesday for a very short visit, back up north again on Sunday. I put some food out when we arrived and it was surprising how quickly the birds found out about some free tucker. I put nets up this morning to see what had arrived and had a very busy few hours. Caught a total of 68 birds of 6 species with 30 new and 38 recaptures, by far the majority were Silvereyes esp recaps, add a couple of Greenfinch and a Bellbird and all but 9 were green. Both the Greenfinch were handsome adult males. House Sparrow - 2 (1) a surprisingly low number. Silvereye - 23 (38) the highest number of Silvereye caught in one day down here, with also the highest number of recaps. Numerous birds were caught several times making it a busy time. 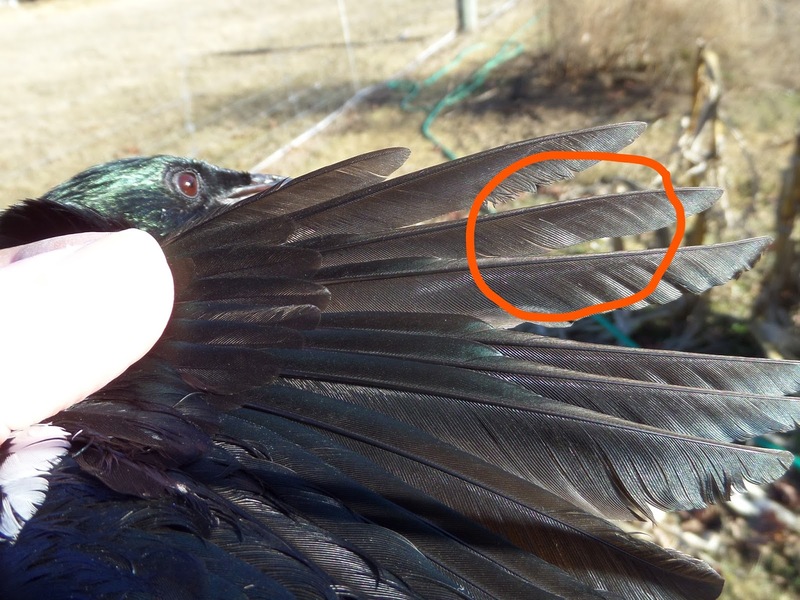 Three of the recaps were banded in Sept 2015 just after banding started here. One caught 685 days from banding is now the oldest bird of any species caught at this property. Bellbird - 0 (1) there were a number of Bellbird and Tui about but this was the only one to find the net. All going well I hope to have another session on Saturday morning.